Igbo language is one of the four major languages in Nigeria. Igbo language is a member of the Niger-Congo family of languages. And it is spoken by about 18 million people in Nigeria, Equatorial Guinea, etc. Love it or hate it, the United Nations Educational, Scientific and Cultural Organization, UNESCO, an organ of the United Nation, UN, in 2012 has said that the Igbo Language will be extinct by 2050. UNESCO predicted that “half of the 7000 plus languages spoken today will disappear by the end of the century?” Already we are in 2018 and so many Igbo groups rather than focus on the solution via promotion of the Language, culture and tradition of Ndigbo were rather busy ranting over the comment by the world body. Any sustained plan to reinvigorate the Igbo tradition, language and culture is a welcomed development. This is one mission the Igbo village and centre for African Civilization (IVACAC), a Directorate in Nnamdi Azikiwe University, Awka, created in the 2016/2017 academic session by the Vice-Chancellor, Prof. Joseph E Ahaneku FAS has taken to achieve before the deadline of 2050. The center has Very Rev. Fr. Prof. BonaChristus Uchenna Umeogu as the pioneer Director and Prof. Okodo Ikechukwu as the Deputy Director. IVACAC has marshalled out plans to ensure Igbo Language, culture and tradition reign supreme first in Nigeria, Africa and the World. According to the Director, Very Rev. Fr. Prof. BonaChristus Uchenna Umeogu, the Directorate was created to preserve and foster “Igboness” (Ejirimara Igbo) in relation to the people who regard Igboland as their ancestral homeland and who think in and speak Igbo language and have their life, and existence in Igbo tradition and culture. The idea is to expose the Igbo civilization to the Igbos, Africa and the world at large. That is the deciding reason why the motto of the directorate is: Enlightening the world through Igbo African Heritage. Since we are talking about “Igboness”, that is, what concerns the Igbo people, the term, “Igwebuike” which connotes the spirit of oneness, collectivism and communalism represents the ideology on which Igbo Village as the centre of African civilization can be developed from a university as an Ivory Tower. Fr Bona who holds a Television programme with the ABS Awka on ‘’The kingdom of God and Igbo University’’, said that the absence of “Obi” in an Igbo community is like the absence of soul in a body, for Obi Igbo is the quintessence of Igbo civilization. The absence of Obi Igbo anywhere in Igbo community will always be a tragedy, because it is indicative of the fact that such a community has no origin, no history, no authority, no people, and no life. So the presence of Obi in Igbo community is always a clear indication of the being and existence of Igbo spirit. So Obi Igbo is the place from which the spirit of Igboness emerges to connect with and possess the Igbo people for the authorization and generation of enlightenment and civilization. 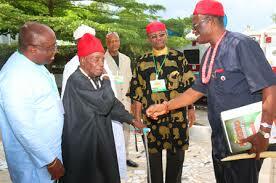 Igbo village and the centre for African civilization is consequently founded on “Ohazurume Igbo”. Ohazurume simply means ‘‘it is the Igbo communal spirit that does things”. That is to say, whether in Igbo or in Africa or in the world “oha” is greater than anyone (Ohaka), that is, the community as instituted by Obi Igbo and personified by eldest males or most important individuals is supreme. In Ohazurume, “Oha” represents the spirit of Igboness or the Igbo spirit or the spirit of Igbo people (both living and dead) which, even though it is arrived at by “consensus communi” and ipso facto by representative or sovereignized Obi Igbo leadership of the council of elders and most important individuals, cannot be faulted by any single individual or village or town, or group, etc. So, Igbo Village and Centre for African Civilization is here to constitute and institute Obi Igbo Ohazurume ideology. Very Rev. Fr. Umeogu noted that the aims and objectives of the Igbo village and centre for African civilization is aimed at excavating the contributions of heroes of the past such as Nnamdi Azikiwe, Mike Okpala, Power Mike, Chukwuemeka Odumegwu Ojukwu, Chinua Achebe, etc, as the foundations of today’s Igbo civilization. From their works and achievements we hope to establish a background to form a foreground in expanding the frontiers of Igbo civilization through Research, Science, Medicine and indeed every aspect of human endeavour. It is important to note that ignoring the works and achievements of such elders and heroes of the past has created a huge gap between them and the present generation and it is this gap that the directorate hopes to fill. Also, the directorate has a view of indigenizing researches by instituting Igbo studies in areas of Igbo Science, Igbo Medicine, Igbo architecture and engineering, Igbo physics, etc. The idea is that before the colonial times, the Igbo society was functional in every sense, but with the coming of the colonial masters, all aspects of these functional structures were abandoned. It is our objective and vision to explore these areas with a view to remodel same for the civilization of mankind. This, Fr Bona hopes IVACAC will achieve by drawing and executing programmes to highlight and showcase the culture and tradition of Igbo extraction to the world; By annual “Ohazurume Igbo Festival” to promote Igbo language and thought through building and remodeling of thought process in a way that will unify the entire Igbo people; Promotion of programmes geared towards engraving the Igbo ideology in the mind of the new generation which is fast loosing hold of what the Igbo culture and tradition really are; Enlightening the world through Igbo-African heritage, by the use of Radio, Television, and Social Media vehicles and programmes among others, etc. Fr Bona, a first class brain all his life and the only Magister Maximus concluded that : ‘’IVACAC has been created to preserve the order of Igbo spirit amidst the march and progress of Igbo civilization. Yes, IVACAC has come to act as the conscience of Igbo people. Of course, “Conscience is an open wound and only truth can heal it”. So IVACAC is concerned not only with fostering and preserving Igbo civilization in the world, but also, with using Igbo spirit, to organically measure and maintain the order and homogeneity of Igbo civilization amidst the changing and heterogeneity of the Igbo times. IVACAC has come to make sure that all Igbo traits and natural inclinations are in consonance with the Igbo spirit. To be sure IVACAC has come to connect Igbo civilization to its source: Igbo spirit, so as to give the world worthwhile enlightenment and civilization. Matching words with action, a maiden Ohazurume Igbo festival was organized as well as fund raising and awards ceremony at the Nnamdi Azikiwe University Awka. At the event, the foundation for the Directorate of Igbo Village and Center for African Civilization (IVACAC) was laid. The construction of the center is to cost Six Hundred and Ninety Six Million, three hundred and seventy six thousand eighty eight naira , fifty kobo (N696,376,088,50). Speaking during the maiden Ohazurume Igbo festival , fund raising and awards , the Director , Directorate of Igbo Village and Center for African civilization (IVACAC), Rev Fr Prof Bonachristus Umeogu said the sum would be raised to build a befitting center for IVACAC in Unizik and appealed for support to make it a reality. The Unizik renowned international Philosophy Professor Fr Umeogu appealed to Governors in the South East led by Ebonyi State Governor, Chief Engr Dave Umahi , lovers of Igbo nation , philanthropists and well-meaning sons and daughters of Ndigbo to rally round and make the center a reality for the future of Ndigbo. The Vice Chancellor of Nnamdi Azikiwe University, Awka , Prof Joseph Ahaneku, FAS said the University was responding to the fear of the eclipse of Igbo language and culture hence the University decided to set up the Igbo Village and center for African Civilization to research on , revive and revitalize Igbo language and culture in the context of contemporary times and to promote /propagate same in tandem with African civilization. Prof Ahaneku appealed to Igbo sons and daughters to assist the University in making the center a center of attraction in Igbo land. In his lecture, the lecturer and President General of Ohaneze Ndigbo , Chief John Nnia Nwodo commended Prof Ahaneku for instituting a General Studies in Igbo in the University to ensure that every student graduating through the institution had a smattering of Igbo language and culture, describing it as a milestone in advancing the culture and language. He frowned at the attitude of some parents who not only discourage their children from grasping the language and culture but ensures they do not speak it with them at home even as he appealed to parents to be vanguards of promotion of the language and culture at all times and shun those who refer to Igbo language and culture as vernacular. He further commended the development strides by the Unizik VC , encouraging him to continue leaving his strides on sands of time as history would judge him creditably. In similar situation, a one day Igbo Renaissance Colloquium held on Sunday June 10th, 2018 during the Golden Jubilee Birthday of Very Rev Fr. Prof BonaChristus Umeogu at the Communio Sanctorum Ministry International ground behind Old Tourist Garden, Awka capital territory near Old English Hotel ended with resolutions for dedicated re-awakening of the Igbo spirit, culture and tradition in the contemporary era. The Colloquium organized by Igbo Spirit , Destiny and Life (ISDAL), Christian Life and Destiny (CHRISLAD) in collaboration with Communio Sanctorum Ministry International Awka was to celebrate Very Rev. Fr. (Prof.) Bonachristus Uchenna Umeogu’s 50 years birthday anniversary. Rev. Fr. Prof. Umeogu an incandescent scholar, a luminous star, who has chosen to be pedagogic in his life, has his personality adored by the literati and intelligentia because he is a notable patriot, a philanthropist, a bridge builder with a passion for humanitarian gestures particularly in the development of philosophy education. Bonachristus has achieved some organon of intellectual artistry, amalgamated with God’s grace and innermost self-disposition. His image is already made by his services to God and humanity. He is like a ‘‘light that shines in darkness but darkness does not comprehend it’’. Fr BonaChristus, a colossus, a titan of his class was seen among the ancients in the days of Socrates, Plato and Aristotle; during the Medieval in the likes of Tertullian, Augustine and Aqunas; among modern intellectuals in the likes of the Encyclopedists, Immanuel Kant, Baruch Spinoza, Newton, Einstein, etc . The colloquium tagged ‘’2018 Great Colloquium for Igbo renaissance-----Solving the problem of Unity and Division in the Cultural Hermeneutics of Igbo Identity’’ was attended by thousands of eminent personalities and clergy. The Colloquium insisted that it is now time for Ndigbo to close ranks to revitalize and re-align their cultures and traditions with their Christian faith to enable them be at par with other major tribes in Nigeria. The attendees called on Ndi Igbo to ensure they preserve and sustain their culture, language and traditions at all times. The colloquium which started with a Holy Mass attracted many Reverend Fathers and sisters, academia, top government officials, and thousands of friends and well-wishers to felicitate with Rev Fr BonaChristus Umeogu, founder of Communio Sanctorum. Speaking, a renowned Catholic Priest in the Archdiocese of Owerri, and the father of African Hermeneutics of Culture, Msgr. Theophilus Okere noted that Igbo identity was never a matter of debate before the debacle of Biafra. He wondered why some communities in Nigeria particularly South-South who speak Igbo and answer Igbo names still see themselves as non Igbo communities by even corrupting their names to sound strange in Igbo language and culture. Msgr. Okere stated further: ‘’…..some unity, some division there always was and there always will be. But, the modern levels and versions of disunity, and, division seen to stem from defeat, and, loss of Biafra and the collapse of all its hopes’’. ‘’Hermeneutics is the act of interpretation.‘’Interpretation means finding and getting meaning out of something. Bringing light to its hidden meaning, obscurities’’. In his submission, a catholic Priest, Reverend Father Dr Raymond Arazu who went down memory lane to discuss the travails and ordeals of Ndi Igbo in the entity called Nigeria with its attendant challenges for over sixty decades. Rev Fr Arazu further revealed that the Igbo race was at a great disadvantage for it could not compete with its better placed and wealthier compatriots, as the meagre savings of the Igbos since 1960 went more into family, village and town rehabilitation projects, than into buying of shares in industries and other business concerns and noted that Christianity has helped to mellow the spirit of the Igbos. As well, Rev Fr Prof Obi Oguejiofor , Director of General Studies Unizik, said that being an Igbo man comes from home where the parents will start early to teach their wards mother tongue, lamenting that some are now weak while the Igbos are known as industrious, hardworking and eager to do new things. In his paper presentation titled Igbo Aphorism as guide and metaphors that presage Igbo renaissance, a former Governorship Aspirant under PDP in Anambra state and former secretary to the state government, Mr Oseloka Obaze said that Ndigbo need to make the best of the circumstance they found themselves in Nigeria and regretted that majority of the Igbo leaders especially those in the corridors of power have not done enough to alleviate the plight of Ndigbo. For former Vice Chancellor of Unizik and President Otusubakwa Igbo, Nigeria, Professor Pita Ejiofor, while regretting the attitude and nonchalant posture of Ndigbo to their language , tradition and culture encouraged Ndigbo to engage in active speaking of their mother tongue without apologies to rekindle interest in the language and culture to avoid the prediction by UNESCO. He traced the efforts of the Otusubakwa Igbo to ensure the language and culture of Ndigbo is respected and recognized world over. Earlier in a homily, Reverend Father Dr Chika Okpalaike said the convener, Fr Bona was born to help the spiritual and healthy evolution of man and to ensure that our life as Igbos is not lost ; advising for the discovery of all that made us Igbo. The moderator of the colloquium who is the Dean School of Post Graduate studies UNIZIK, Professor Ike Odimegwu said though we learn education with English language but vernacular gives deeper meaning more especially by using idiomatic expressions. Another speaker, Prof. Tracie Utoh-Ezeajugh who is the Dean, Faculty of Arts Unizik insisted that the challenge against Igbo language, culture and tradition should not be only focused on men. She said also that it is disgusting and against Igbo tradition and culture for women to strap their child on their back and be begging along the roads or on top of bridges. Contributing, an Expert on Entrepreneurial Studies, Chukwuemeka Odumegwu Ojukwu University, Igbariam , Prof Felicia Uchehara in her paper entitled: ‘’How does culture influence the entrepreneurial behavour of the Ndigbo?’’, said though culturally, Ndigbo are endowed with proven acclaimed character-traits of successful, entrepreneurs, but there are challenges facing the achievement of these potentials. She noted that: ‘’to arrest this ugly situation for a better society, social entrepreneurship need to be encouraged. Social entrepreneurship is different from commercial entrepreneurs that seek financial gains. The successful Igbo entrepreneurs need to be encouraged to use part of their profit to establish/encourage the economic development of the unemployed and vulnerable groups in Igboland. ‘’What the Communio Sanctorum International Ministries is doing today and always such as; attending to the sick, empowering the youth through imparting knowledge, and attending to other social problems during first Thursday in the monthly prayer sessions is called social entrepreneurship. A priest who finds time to attend to the social needs of the people is referred to as “Clergypreneur”. It follows therefore that very Rev. Fr. Prof. Bonachristus Umeogu is a Clergypreneur. In appreciation, the convener of the Colloquium, Reverend Father Professor Bonachristus Umeogu who is a Professor of Philosophy in Faculty of Arts , Unizik as well as an Igbo Renaissance Promoter made it clear in his golden birthday celebration that the recreation of Igbo civilization cannot but be the work of the faculty in our universities. And he made it clear that the faculty of Arts Nnamdi Azikiwe University has done a lot in this regard. Fr Bona said: ‘’ Yes, Arts humanize culture and cultural identity and in the faculty of Arts Unizik, there is the department of Igbo and they have made the Igbo people proud of their language and culture by their ‘’Ogbalu Lectures’’. The Department of Linguistics in their Igbo Language studies have gone very far in advancing Extensional suffixes and clichés in Igbo cultural identity. The department of History as the memory of the Faculty of Arts, Unizik, has articulated Igbo difficult history in a body of writings in her different seminars and conferences. The Department of Theatre Arts as the performance hands and legs of the faculty have in their original and creativity outputs re-enacted Igbo life and culture in a world of lived expense’’. ‘’The department of Music as partaking in the performance hands and legs of the Faculty have recovered Igbo musical identity at the complex of Igbo ethnomusicology. The Language departments of English Language and Literature, Modern European Languages, African and Igbo Languages have all, as the tongues and voices of the Faculty of Arts, Unizik created a comparative Igbo language environment that gave Igbo cultural identity a verbal expression and meaning. The Department of Religion have worked on Igbo religious identity in their lectures and conferences in such a way that the proper inculturation of God in Igbo religion is now a reality. And the Department of Philosophy in their symposia, workshops, and Ogirisi Igbo festivals have advanced and been in the forefront of Igbo Philosophy of culture’’. ‘’From this great Faculty of Arts, I was appointed the Pioneer Director of the Directorate of Igbo Village and Center for African Civilization (IVACAC), Nnamdi Azikiwe University, Awka . So, in the great Faculty of Arts, the Gown and the Town (the University and the Igbo World) have met in undivided unity (Indivisa Unitas). As the servant of Jesus Christ, Fr BonaChristus was born for the rising and falling of many in the world, with a great mission for God and Humanity. Rev Fr Prof Bona Umeogu and his zeal in God given mission cannot be stopped by liars, envious, jealous and wicked people. Fr Bona pointed out that the homogenous Igbo culture has been made heterogeneous by the onslaught of other extra cultures such as the colonial, Christian, European, American and Asian business cultures, as well as the cultures of science and Technology. Fr Umeogu said he established Christian Life and Destiny (CHRISLAD) not only to solve the problem of unity and division in Christian cultural identity but also to solve the problem of unity and division in the sheep and other sheep, referring to what Jesus Christ said in John 10: 16 ‘‘I have other sheep that are not of this fold. I must bring them also and they will hear my voice, and there shall be one flock and one shepherd’’. He explained that to have one flock and one shepherd is the purpose of the theory and principles of cultural hermeneutics, which must explicate the implicit meanings and interests of God and His people in all Churches. He concluded that Igbo Spirit, Destiny and Life (ISLAD) has come to establish Igbo cultural identity , Nigerian cultural identity and African cultural identity by the power and authority of the theory and principles of cultural hermeneutics, while Christian Spirit , Life and Destiny (CHRISLAD) has come to establish Christian cultural identity by the power and authority of the theory and principles of cultural hermeneutics. Fr Umeogu further lamented that the homogenous Igbo culture has been made heterogeneous by the onslaught of other extra cultures including the colonial culture , the Christian culture , cultures of science and technology , the cultures of the European , American and Asian business communities. Earlier in a press brief , Bro Damian Ofornagoro , President , Governing Council Communio Sanctorum Ministries International summit dwelt on resolving Igbo ontologies shown in relation to colonization, Education, Religion, Specialization, etc and reached common grounds of , “solving the problem of unity and division in the cultural hermeneutics of Igbo identity. Bro Ofornagoro said that Fr Bona as a Catholic Priest, University teacher, Philosopher and Spiritual director of the Communio Sactorum Ministry International has propounded theories and principles of cultural hermeneutics that have in their intra, extra, contra, inter, supra and intergo proportions unified the militating factors of qualifications that work against Igbo cultural identity. He said Fr Bona concluded in his thesis on cultural hermeneutics and the problem of unity and division in Igbo Identity that the Identity of a people is always a function of their culture, hence he argued that Igbo identity must come from the hermeneutics of Igbo culture. Fr Bona Umeogu as he is fondly called had said that : ‘’Igbo culture is the Igbo way of life interpreted from the identity of Igbo knowledge, belief, law, custom, art, morals and other inclinations, capabilities and traditions acquired and developed by Igbo people as citizens of Igbo land. So Igbo Cultural identity becomes the domain in which theories and practices, impressions and expressions, times and traditions, etc continue and unite all things in Igbo being, and belonging, despite the factors that discontinue and divide Igbo cultural essence and existence. ‘’Igbo Cultural Identity is no longer a homogenous one, because of the onslaught of colonialism, religion, science, modernism, Globalism, etc. The result is that Igbo cultural identity stands divided by these cultural agents of incidence and influence’’. ‘’But there is a paradox to all these: that in all these dividing dimensions the same Igbo Person, the same Igbo people, the same Igbo race, the same Igbo nation “is” involved. We are not talking of a divided disunity but of an undivided unity. So if you ask the question: who is a native doctor and who is a medical doctor, or who is a pagan and who is a Christian, or who is a barbarian and who is the civilized, etc, the answer must remain---the same Igbo person, the same Igbo people, the same Igbo race, and the same Igbo nation. So these qualifications should stop dividing the Igbo person, the Igbo people, the Igbo race, the Igbo nation. These qualifications should stand to qualify Igbo identity and be qualified by Igbo cultural identity. Fr Bona is not only after the spiritual life but also the health of the children of God as God gave him a revelation on how to use pure and qualitative natural herbs through inspiration to produce powerful and all healing medicinal drugs and pharmaceutics. In his Living Communion Drugs, he has over 300 different drugs with names and ranges from cure to epilepsy to solution to infertility and glandular problems, to mention but a few. There are testimonies everywhere. This he said is possible because ‘’in nature we have a living communion with the virtues and powers of God, for the medicinal and mystical health of the body, the mind and the spirit. In nature, we have a living communion with the life of God. God came in (human) nature that we may have life and have it to the full (John 10:10)’’. There is nothing else in the rock of living health better that ‘Living Communion Drugs’ a distillation and synthesis of the best roots and barks and leaves and flowers and fruits of nature. In ‘Living Communion Drugs’, you have a pure and qualitative access to the ageless health and prevailing healing energy of God, for wholesome life.